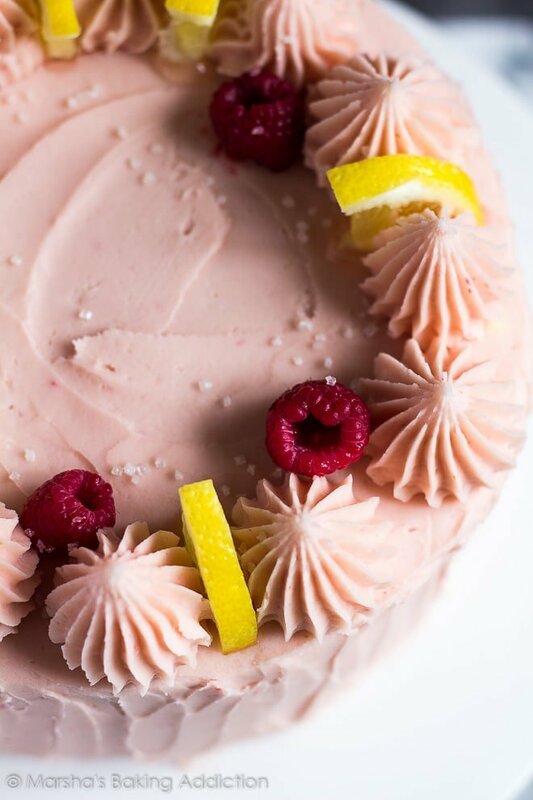 Lemon Raspberry Layer Cake – Deliciously moist and fluffy lemon infused cake frosted with a creamy raspberry buttercream, and topped with fresh raspberries and lemon slices! Lemon and raspberry together just scream spring and summer time, and I’m craving some warm sunshine. 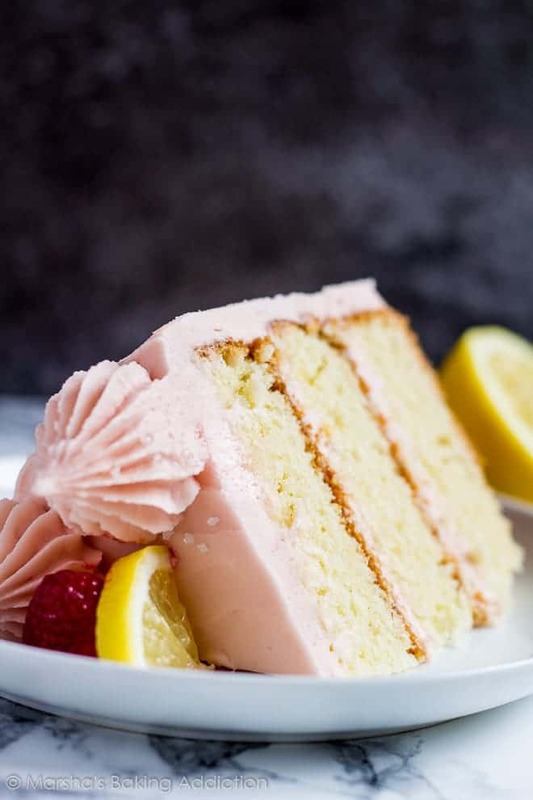 So today, I bring you my Lemon Raspberry Layer Cake. 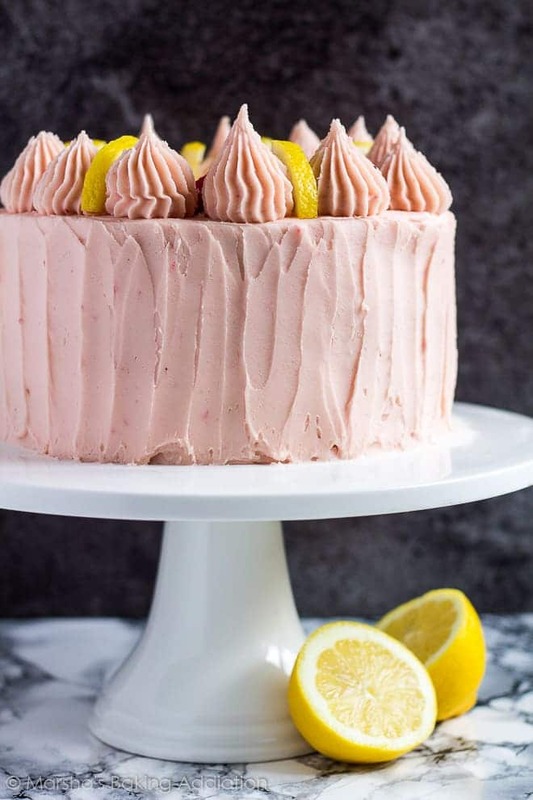 This lemon raspberry cake is made up of three thick layers that are infused with lemon, and filled and frosted with a creamy raspberry buttercream. 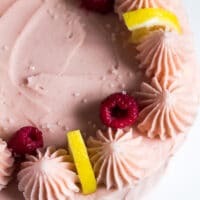 Topped with buttercream swirls, fresh raspberries, and lemon slices, this is the perfect spring/summer dessert to serve to a crowd. 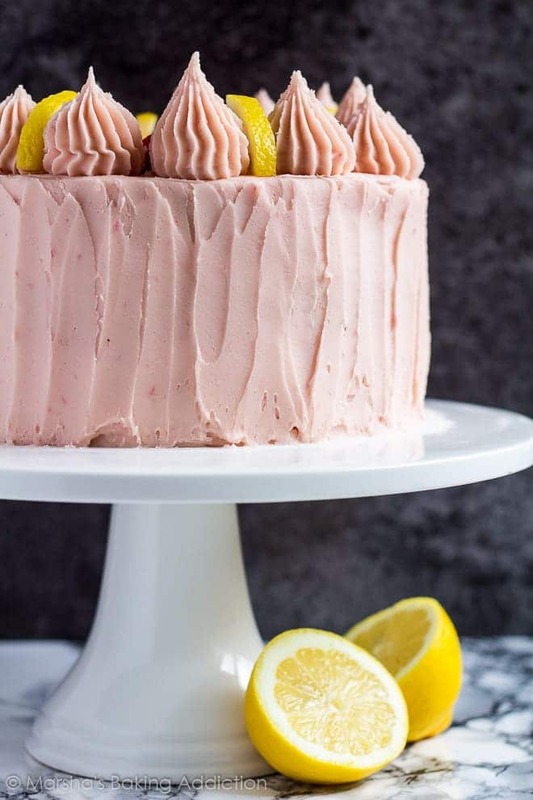 the best lemon raspberry cake that is perfect for Summer! 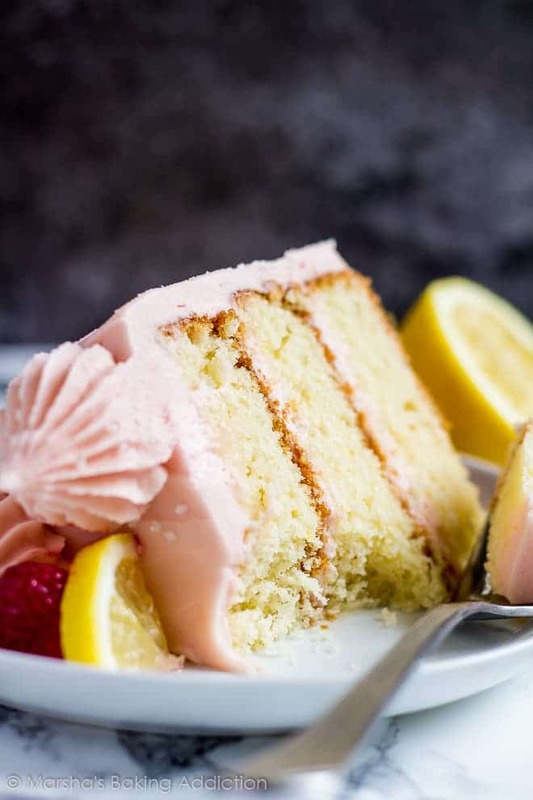 This moist and fluffy lemon raspberry layer cake uses melted butter, which means no mixer required (only for the frosting), making this recipe super quick and easy to throw together. The cake layers can be made a day in advance, wrapped in clingfilm ready to be frosted the next day. The frosting can also be kept refrigerated overnight – convenient for when you’re busy or in a rush! Check out more layer cakes! 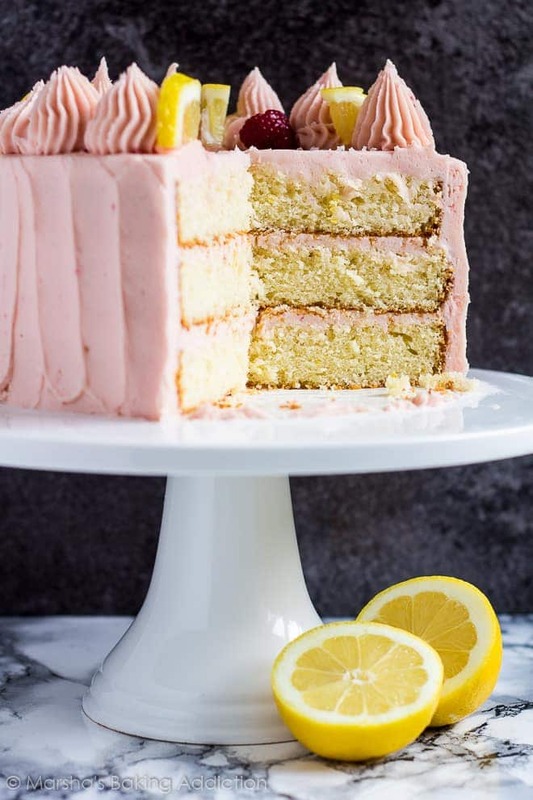 Deliciously moist and fluffy lemon infused cake frosted with a creamy raspberry buttercream, and topped with fresh raspberries and lemon slices! Preheat the oven to 170C/325F/Gas 3. Grease three 8-inch cake pans and line the bases with parchment paper. Set aside. Whisk together the eggs. Add the sugar, and whisk until combined. Add the lemon zest, extract, butter, and yogurt, and whisk until combined. Gradually fold in the dry ingredients. Divide the batter between the prepared cake pans, and bake for 30 - 35 minutes or until a toothpick inserted into the centre comes out clean. Allow to cool completely in the pans on a wire rack. Once cooled, invert the cakes onto the wire rack and remove the parchment paper. Using a food processor, process the raspberries until smooth. Drain the mixture through a fine mesh sieve into a small bowl, discarding the pulp and seeds. Set aside. Using a handheld or stand mixer, beat the butter until pale and creamy - about 5 - 10 minutes. Add half of the icing sugar, and beat for about 3 minutes until light and smooth. Add the remaining icing sugar, and salt, and beat for another 3 minutes until smooth. Add the raspberry sauce, and milk, and beat until light and fluffy. To assemble, slice a thin layer off the tops of the cakes to create a flat surface. Place 1 cake layer on a cake stand or serving plate, and spread on a layer of frosting. Top with the 2nd layer of cake and repeat. Top with the final layer, and cover the entire cake with a thin layer of frosting to lock in the crumbs. Refrigerate for about 30 minutes until the frosting is firm, then spread with the remaining frosting, leaving some for piping swirls on top if desired. Garnish with raspberries and lemon slices. *Make your own cake flour! Measure out 4 and 1/2 cups (562g) of plain/all-purpose flour, remove 9 tablespoons, and replace with 9 tablespoons of cornflour/cornstarch. Sift well. After the cake layers have cooled completely, they can be wrapped in clingfilm and kept at room temperature or refrigerated/frozen overnight, ready to be frosted the next day. The frosting can also be stored in an airtight container and refrigerated overnight. Frosted cake freezes well for up to 2 months. You may have some frosting left over, save it for cupcakes or cookies! Lemon and raspberry totally scream summertime! And in the most delicious way possible, too! Marsha, I have to say, you’ve truly outdone yourself! This cake is beyond breathtakingly gorgeous. I could stare at it for days! Can’t wait to see what other summer & spring treats you bring to us! Happy Monday! This cake is absolutely stunning, I love the soft pastel colour of the frosting. My little niece is turning 10 this weekend, I think that I found the perfect cake to bake for her. Thank you for a stunning recipe. Perfect timing ! Perfect photos ! Thank you so much ! Although your recipe is great but I’m allergic to fresh raspberries, is there anything else that can replace fresh raspberries? This is a really nice recipe. However, I only have 9 inch pans at home, so i ask, can I make this recipe with 2 pans of 9 inch, instead of 3/8 inch. I made this last night for a friend’s birthday! the FROSTING WAS AMAZING!!! However, the only thing I am wondering is if we did something wrong with the cake, because it was super dry. We followed everything pretty well, leveled off all ingredients. Did we cook the cake too long? we let the cakes cool then frosted them, then put it in the fridge overnight. I did not cover it when i put it in the fridge, maybe that is why?